Jazeman raced at Abu Dhabi’s Yas Marina circuit last weekend, taking part in the inaugural Gulf 12 Hours sportscar endurance race. 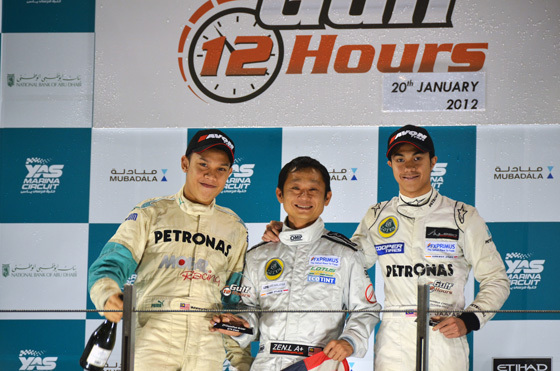 Jazeman celebrated a second place podium finish in GT4 class after enduring one of the most challenging weekends of his racing career. Sharing the driving duties with fellow Malaysian, Hiqmar Danial, the duo piloted a Lotus 2-Eleven with the FX Primus Aylezo Racing Team, enduring a tough race to complete the distance. Jazeman says of the experience, “I knew it would be a long weekend, but I don’t think I fully appreciated just how tough it would be. When you do a race like this it’s not just 12 hours, it is the build up too, so from the first session on Thursday right through to the chequered flag we were totally immersed in making sure the car was able to go the distance. The event wasn’t without its dramas for the team, with a series of reliability issues limiting the amount of practice and qualifying laps that Danial and Jazeman could complete. During the race the team were forced to make a number of pitstops to sort small technical problems which threatened to stop them running, with an engine misfire causing a lengthy pitstop nearly halfway into the race. Jazeman now returns to the UK to continue his preparations for a new season of racing in Europe.